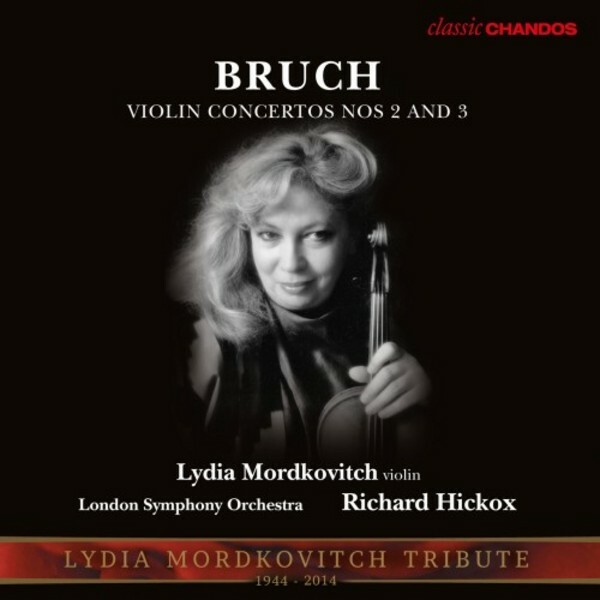 As part of our tribute to Lydia Mordkovitch, this re-issue features Bruch’s Violin Concertos Nos 2 and 3 performed by Lydia Mordkovitch with Richard Hickox and the London Symphony Orchestra. Both were recorded in 1998 in Blackheath Halls in London. In Violin Concerto No.2, ‘Hickox draws radiant sounds from the LSO; Lydia Mordkovitch [...] plays with rapt dedication at speed, producing pianissimos of breathtaking beauty’, according to The Guardian. The piece is unusual in having a slow first movement, which is broad and powerful in its orchestration and contains brilliant passagework for the soloist. It is followed by another unusual feature, a middle movement in the style of a recitative, leading directly into a substantial and rhythmic Finale. Unlike its two predecessors, Violin Concerto No.3 is written in the classical mould. Its robust opening concertante movement is broad and heroic rather than lyrical. It precedes a slow movement reminiscent of that of the famous First Concerto, and a Finale in a conventional rondo form, dominated by a strongly rhythmic perpetuum mobile.